When looking for the best type of plastic cups on the market look no further than the new Custom Printed White Plastic Cups from Gator Paper. 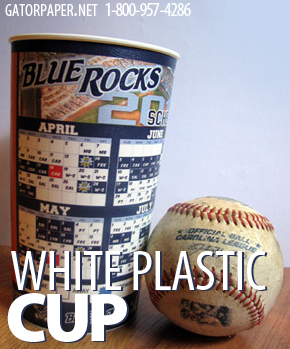 Souvenir cups can help market your brand with your customers bringing them back time again. Available in multiple sizes, 9oz, 12oz, 16oz, 17oz, 20oz, 24oz, 32oz, & 44oz, this style cup is durable and reusable. This custom printed white plastic cup will ensure your brand exposure over and over again. The quality of this cup is top of the line, with full color process printing technology ensuring your cups impress the competition. Gator Paper offers top of the line food packaging, restaurant supplies and more. Gator Paper leads the market in customer service among it’s customers because we want you to love your supplies. Ordering your products should be just as easy! Most all products are available with full color process printing. Exactly what you want, to add your unique brand to your products. Whether you need paper napkins, custom foil sheets for hot foods, scoop cups for sides or souvenir cups for customers on the go, we have just what you are looking for! Available in multiple sizes, 9oz, 12oz, 16oz, 17oz, 20oz, 24oz, 32oz, & 44oz. Souvenir cups for customers to be proud of! Check out our website and explore the food packaging supply option today! You will love all we have to offer. Especially the great shipping deals and the order quantity options. We at Gator Paper want to fulfill all your ordering needs. The friendly customer service team is standing by for your call to answer all questions and help you get exactly what your business wants.